Fix fallen hems and repair clothing with the ultimate quick-fix fastening system. Say goodbye to pins, glue and large tacks. You can now use the MicroStitch tool to fix fallen hems and repair clothing, and for home decorating and craft projects. This patented system features a lightweight, hand-held tool that&apos;s reliable and easy to use, with a durable metal-feed mechanism. Its micro fasteners are better than thread, metal staples or pins, and hold fast and tight. 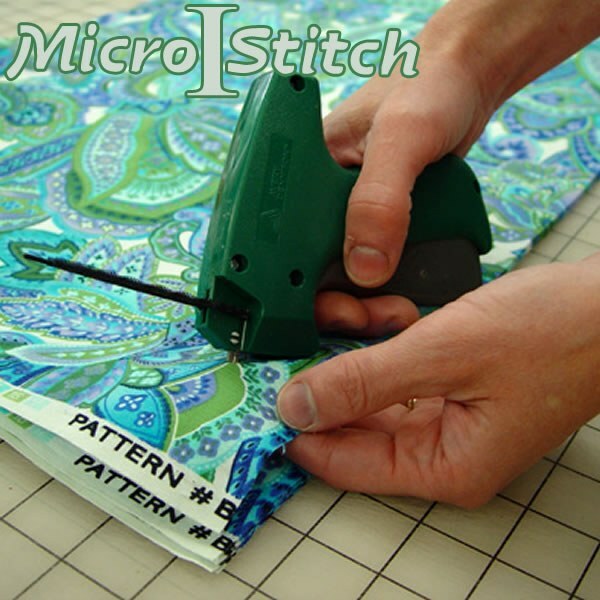 With the market&apos;s smallest needle and smallest tacks, MicroStitch is also gentle on fabric. The tiny, versatile fasteners apply easily, can be sewn over, and remove with a quick pull or snip. For quilters, it makes the basting process faster and easier, with tacks that are 35% smaller than other options. I hope refills are available! This thing is so handy! I even used it to attach the gas lid on my car! !